Koji Japanese Restaurant in Parsons Green is a joint collaboration between Nobuhisha Takahashi, the former sushi head chef at both Nobu London and Nobu Cape Town, and Mark Barnett, the former proprietor of the now closed Mao Tai Chinese restaurant. The Koji concept centres around contemporary Japanese dining, ranging from fresh sushi and sashimi being carved out at the beautiful sushi bar, to meats and seafood caramelising sweetly on the robata grill. On the a la carte menu is an array of modern Japanese dishes that draw influences from South America and Europe. Koji offers a sophisticated yet relaxed atmosphere. Towards the front of the restaurant is a cocktail bar offering light snacks and the sushi bar where diners can choose to eat their meal whilst watching the sushi craftmen at work. In the restaurant proper is a buzzy restaurant where diners can relax in well-appointed surrounds. 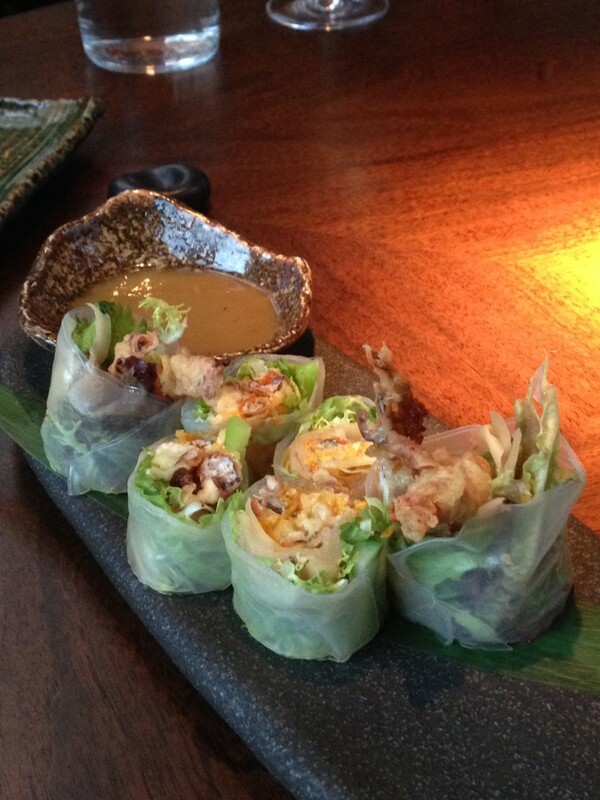 We started with the summer roll with soft shell crab (£15) which was gloriously fresh and summery. The crab was sweet and meaty with a crunchy coating, and it had been paired with seasonal asparagus, tangy pickled ginger and some fragrant shiso leaf. To hold together all the deliciousness was an outer roll of beautifully made soft Vietnamese rice paper. A yuzu dressing added a citrusy and refreshing touch to the roll. Claude Compton previously cooked at Petersham Nurseries and Club Gascon, and with his restaurant Claude’s Kitchen, he now combines his Michelin experience with beautifully fresh ingredients to produce a wholesome British menu. The fish is brought down daily from Cornwall, the meat is organic and free-range and he also makes wonderful use of seasonal greens throughout his dishes. 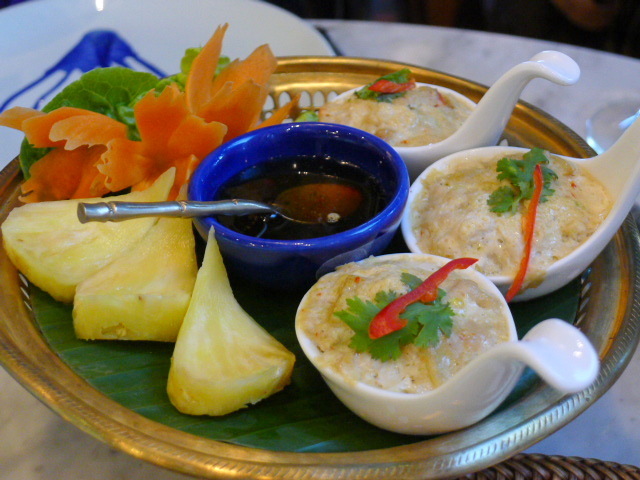 Claude’s Kitchen is located on the first floor of the Amuse Bouche Champagne Bar in Parsons Green. It’s a cozy little outfit – uniquely comfortable and wonderfully relaxed. The menu was not extensive but everything was wonderfully inventive and creative. There were touches of the fine dining to it with inclusion of elements such as dehydrated olives and parsnip foam. Yet the food was rustic and comforting and unpretentious. But best of all it tasted incredibly fresh. 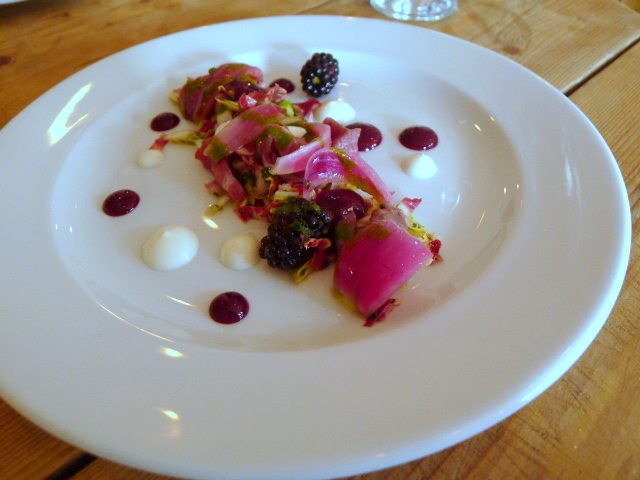 An inventive dish of raw beef fillet (£7) with blackberries, red onion, dandelion, chicory and horseradish was delectably interesting. The beef was meaty and tender and beautifully balanced against the sweetness of the berries and blackberry sauce. There was also an earthiness coming through from the dandelion and chicory and a gentle hint of heat from the horseradish that rounded off this refreshing dish. Every time I have gone past Manson Restaurant on a Friday or Saturday night it always seems to be heaving with people. And with good reason. Perched on Fulham Road in Parsons Green, it has a ‘neighbourhood’ feel to it with the exterior exuding a certain charm and warmth which makes it hard to ignore. The interior of the restaurant is just as pleasing on the eye. There is a separate bar area and lots of wooden touches throughout the restaurant to round of its cosy appeal. Stopping by for a Sunday lunch, I was pleasantly surprised the quality of the British cooking. 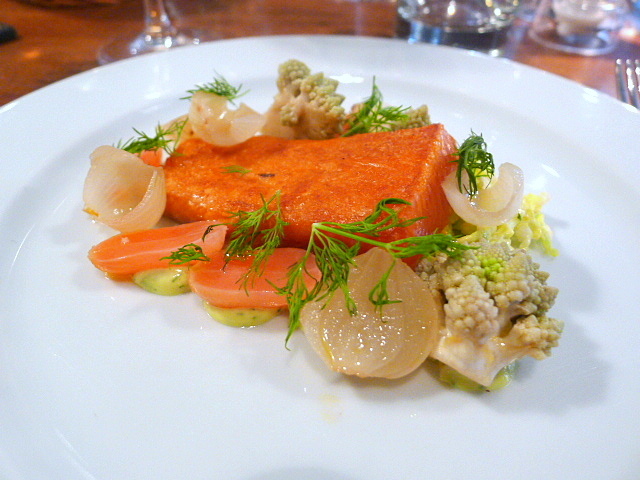 A dainty looking dish of caraway cured sea trout (£7) was lovely. The tanginess in the side of pickled cabbage worked well with the fish, and the use of dill added a lovely fragrance to the dish. The first time I went to the Harwood Arms (click here to read about that meal), I was bowled over by both the wonderful quality of the food and the very reasonable pricing. Resident Harwood Arms chef Stephen Williams trained under Brett Graham at The Ledbury which now holds two Michelin stars. So while the Harwood Arms may be a collaboration between Brett, Mike Robinson from The Pot Kiln and Edwin Vaux from the Vaux brewery, it resonates with Brett’s trademark cooking. 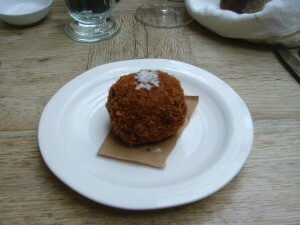 It’s little wonder then that the Harwood Arms won its first Michelin star earlier this year. With its new star rating, bookings have gone through the roof. Its focus has switched solely to the food, and so it’s dropped the gastropub label. There is still a bar area at the Harwood Arms, but this is mainly used for pre-dining aperitifs with casual pub drinking now being frowned upon. 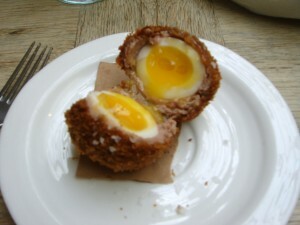 My last visit to the Harwood Arms was over a year ago, and ever since then I have yearned for their wonderful venison Scotch egg (£3). A perfectly cooked runny egg encased in beautifully seasoned venison meat and coated with crispy breadcrumbs delighted once again. However, from memory there use to be more meat to be had.